"Toy Story" was the first major feature from Pixar in 1995, and it was an immediate hit. The subsequent films, premiering in 1999 and 2010, have also been enormously popular. With such a long stretch of success, it makes sense, then, that Woody, Buzz Lightyear, and the other beloved characters from the franchise would get their own home at Walt Disney World. 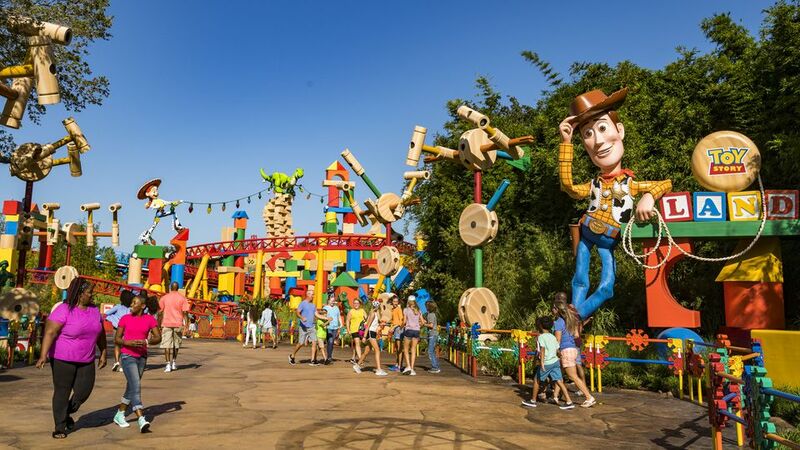 Located at Disney’s Hollywood Studios, the 11-acre Toy Story Land is cute and engaging. Although it's geared to young children, the land resonates with any fans of the movies, regardless of age. The premise is that by walking into the land, human visitors are transformed into honorary toys and are invited to play with Andy’s toys. (For those who need to brush up on their "Toy Story" knowledge, Andy is the boy featured in the movies whose toys spring to life whenever he is not around.) The Toy Story Land setting is Andy’s backyard, where everything is oversized. Upon entering, guests are essentially shrunk to the size of a toy. Walking through the land, visitors encounter enormous sneaker prints left in the dirt by Andy, huge blades of grass, and immense toys such as large wooden blocks, a massive Jenga tower, and Tinkertoy assemblies serving as support structures. A giant Sheriff Woody greets visitors at the main entrance while a colossal Buzz Lightyear figure anchors the other side of the land. They both make great backdrops for photos. Andy, it seems, is a budding park designer, and he has created a makeshift amusement park in his backyard using his toys and other materials at hand. It can be a lot of fun to wander around and observe the many fun details that Disney’s Imagineers have embedded throughout the land. The sign above the bathrooms, for example, is fashioned out of Scrabble letters, and Andy apparently placed the “S” tile upside down. There are three attractions, two that opened with the land in 2018 and one that pre-dates it. Slinky Dog Dash: This is the ride that snakes throughout the area and fills the land with energy. As with everything else in his backyard, Andy created it using found materials, in this case a “Mega Coaster Play Kit.” His adorable toy, Slinky Dog, serves as the train. Having said that, the initial launch of the ride can be disconcerting for kids who have never experienced one, and there are some moments of out-of-your-seat airtime, albeit brief, as well as other slightly hairy moments. For the sake of comparison, the Toy Story Land coaster is slightly more aggressive than Seven Dwarfs Mine Train at the Magic Kingdom, but less imposing than that park’s Big Thunder Mountain Railroad. About halfway through the course, the ride momentarily stops, and a second launch propels it up another hill. Passengers navigate a series of small bunny hills before the train returns to the station. As with everything in Toy Story Land, it is nearly as much fun to watch the coaster as it is to ride it. Alien Swirling Saucers: This is the second ride that opened with Toy Story Land. A spinning ride, it uses the same system as Mater's Junkyard Jamboree, one of the attractions at Cars Land, part of Disney California Adventure. It features the funny green alien creatures from the movie's Pizza Planet. The ride vehicles whip around a bit, but even the youngest children should be able to tolerate it. (The height requirement is 32 inches.) Most adults should be okay as well, unless they have an aversion to spinning rides in general. And even if spinning rides make you a bit uncomfortable, Alien Swirling Saucers is fairly short. Toy Story Mania: This third thrill is a wonderful ride-through, interactive experience in which passengers shoot at virtual targets and compete against one another to score points. Designed as a series of carnival games with a "Toy Story" theme, the ride was an Imagineering breakthrough when it first opened in 2008. This "E-ticket ride" has long been one of Disney World’s most popular attractions. While building Toy Story Land, Disney expanded the ride’s capacity by adding a third track. It also moved the entrance so that it is now inside the land. The homegrown design of its new facade is in harmony with the rest of Andy’s backyard. In addition to the giant static figures of Woody and Buzz, there are walk-around characters of Andy’s toys that interact with visitors in the park. As with most Disney World meet-and-greets, the Woody and Buzz stand-ins don’t talk but do their best to communicate via pantomime. There aren’t any shows, per se, in Toy Story Land, but a brigade of Green Army Men do march through periodically and perform impromptu drum corps ditties. A second group of Green Army Men, led by Sarge, patrol the land as well. They stop and lead drills with guests and, like Woody and Buzz, pose for photos. Known as “face characters” because they don’t wear costume heads, the toy soldiers (especially Sarge) do talk and will converse with guests. There is one dining location in Toy Story Land, the quick-service eatery, Woody’s Lunch Box. The name is meant to be taken literally—the food stand is housed in a (humongous) Sheriff Woody metal lunch box. Andy has propped up the cover of his box with a Woody Thermos. The menu features foodie takes on classic grade school dishes such as a grilled cheese sandwich that has three types of cheese oozing out of a garlic butter-grilled roll. What could be better to go with grilled cheese than tomato soup? The Toy Story Land version is seasoned with basil. Other choices include a BBQ Brisket Melt and a S'more French Toast Sandwich for breakfast. For dessert, the Lunch Box offers gourmet re-imaginings of Pop Tarts. Of course, there are things to buy in the land. There are no permanent shops, but there are two merchandise carts hawking everything from a Buzz Lightyear Bubble Blower to a green space Alien headband complete with a row of three eyes. For visitors seeking mementos of the land, Disney offers miniature versions of the Slinky Dog Dash coaster and a replica of an Alien Swirling Saucers ride vehicle. Consider touring the land at night as well as during the day. During the day, you’d be able to appreciate many of the charming details. But at night, you’d be able to enjoy Toy Story Land with beautiful lighting thanks to the Christmas bulbs (oversized, of course) that Andy has strung haphazardly. A nighttime ride on Slinky Dog Dash, which meanders through the holiday bulbs, can be enchanting. Another reason to visit at night: There is precious little shade in Toy Story Land, and hanging around there in Florida’s midday sun can be taxing. As with any visit to Disney World, but especially in the shade-deficient land, make sure to keep yourself hydrated, and apply plenty of sunscreen. Be sure to take full advantage of the My Disney Experience website and app. Also, make advance Fastpass+ reservations for the Toy Story Land rides. As with many of Disney World’s rides and attractions, the standby lines can become long, and wait times can become onerous. This is especially true in Hollywood Studios because there are comparatively fewer rides available in that park. It's particularly advisable to book a reservation for Slinky Dog Dash, as there is no cover above much of the standby queue, meaning no shade or sun relief. The wait times for Toy Story Mania can swell also, but at least visitors in line can beat the heat in the attraction’s air-conditioned building. Use the Mobile Food Ordering feature on the My Disney Experience app. That way, you can skip the lines at Woody’s Lunch Box and prepay for your food. You can only order in advance on the day you are visiting and while you are in the park. Mobile Order is also available at a number of other quick-service restaurants throughout Disney World. Take advantage of the Extra Magic Hours benefit. This gives you the chance to get into Disney's Hollywood Studios on select mornings and visit Toy Story Land before the general public, especially if you will be staying at one of Disney World’s resorts or other participating hotels. During Extra Magic Hours, all three of the land’s rides are open. As an additional bonus, the temperatures should be cooler during morning visits. Consider capping off your early tour of the land with breakfast at Woody’s Lunch Box.